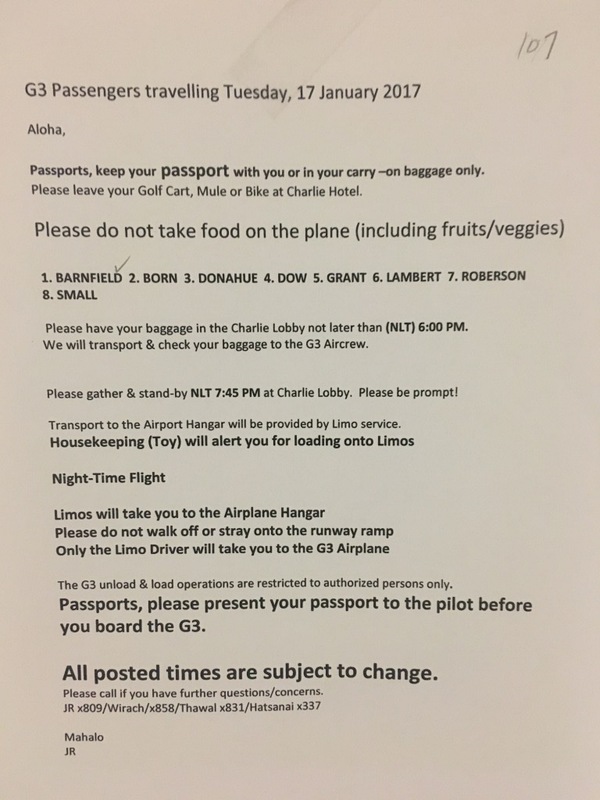 We got our marching orders Monday, 24 hours prior to departure Tuesday night; an A4 sheet of instructions stuck to our bedroom doors upon our return from dinner! 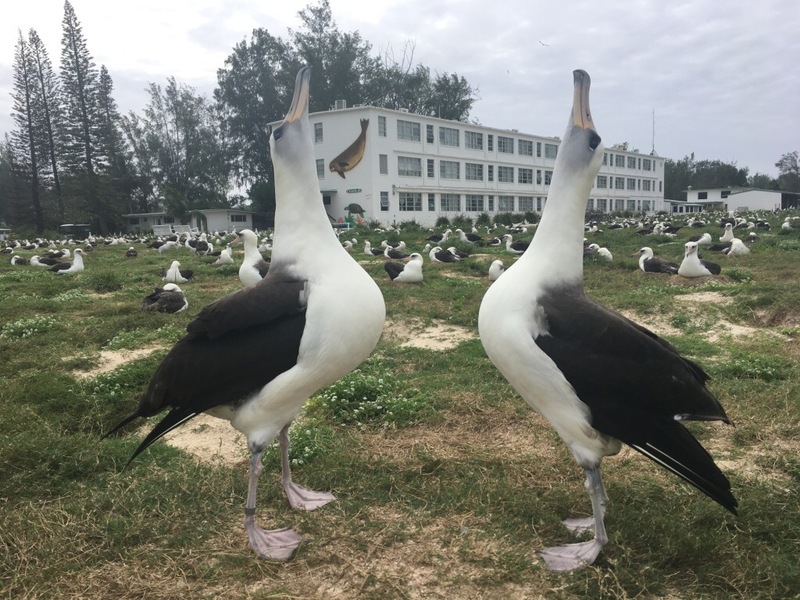 A sad reminder that our time on Midway Atoll was up! After a 3-day weekend, we had hoped to be able, on our last day, to spread rodenticide (in the ongoing mouse battle) but, in keeping with the past 10 days, the weather didn’t cooperate. It needs a 72-hour window of good weather to be effective and, although Tuesday was mostly dry, more rain was forecast for Wednesday. Very frustrating for all concerned, with 7 extra bodies available on island and keen to help. 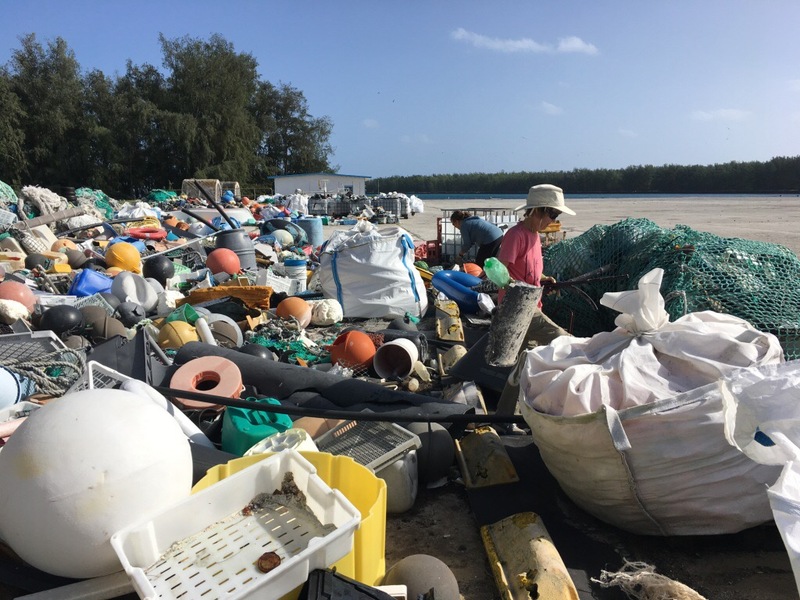 Even with all the publicity regarding the obscene amounts of trash littering our oceans, it has been a depressing education to see in person the piles of human garbage that wash up daily on these otherwise pristine beaches, and the detrimental effect on the wildlife. On a happier note, Monday marked the discovery of the first known albatross chick of Hatch Year 2017. We are so fortunate to have experienced this before we left. 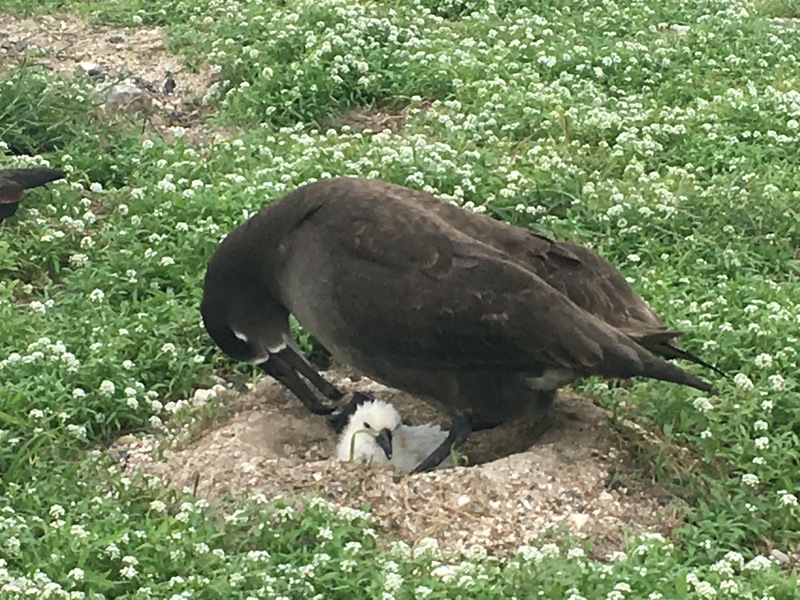 Laysan hatchings on Midway lag a little behind those on the main Hawaiian islands, but the Blackfoot albatross are typically a couple of weeks ahead of the Laysan, so several of us had been keeping an eye on the Blackfoot nests over the past few days. This sighting was particularly special for me, since we don’t have nesting Blackfoot albatross on Kaua’i. Until Midway, I’d only ever caught a distant glimpse of a Blackfoot a couple of times on rare fly-bys at Kīlauea Point. Interestingly, the newborn Blackfoot chicks appear almost white, far paler than Laysan chicks. After Monday’s ‘first’, several reports of chicks and ‘pippings’ followed quickly on Tuesday. In days, the island will be covered in rapidly growing fluffballs. I envy those who remain to experience the coming months. 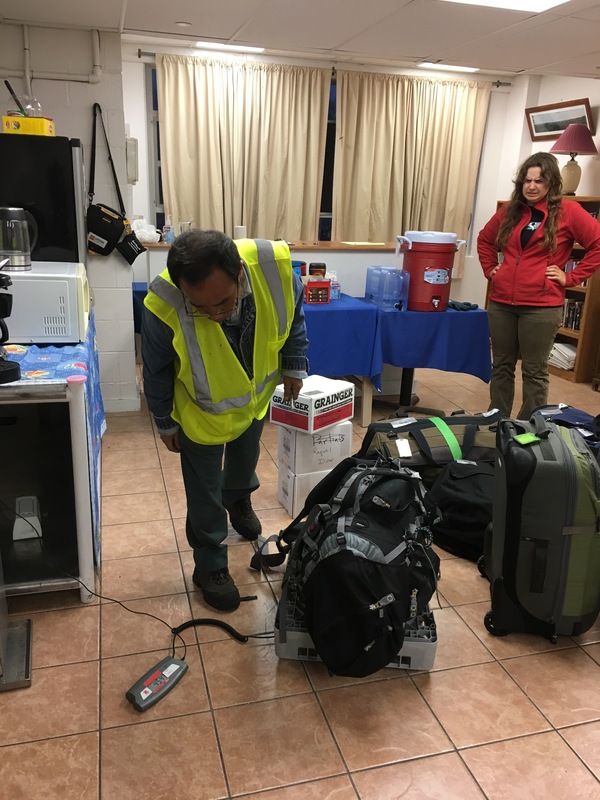 Our last evening was rather drawn out as the incoming plane was delayed, but it gave us extra time to enjoy the company of the staff and volunteers who joined us in Charlie Barracks…and to watch Toy recording the precise weight of every one of our bags before loading onto to the small G3 jet. Farewells were tough, but made easier with the exchange of email/Facebook contacts and the promise of enduring friendships. With limited internet access on the island, I’ve posted infrequently and been restricted to a very few low resolution photos, so, even though my time there is done, I’d like to share some more Midway experiences, including videos, in future posts. I left Midway Atoll NWR with so much gratitude for this unique experience, countless special memories that will last my lifetime, and a burning desire to return.